Three Palestinian trawling vessels confiscated by Israeli naval forces were returned today almost immediately following yesterdays announcement that three Human Rights Groups had filed an appeal against Ehud Barak and the commander of the Israeli navy. The vessels were stolen from Gazan waters on 18th November while fishing in Palestinian territorial water. Filed yesterday by Al-Mazan, the Palestinian Centre for Human Rights (PCHR) and the International Solidarity Movement (ISM), the appeal to the Israeli Supreme Court was on behalf of the vessels’ owners. The appeal, sent to the Israeli Supreme Court, asked why the boats have not been released and why the fishermen have not been compensated for their loss of income and their loss of use of the boats for the past week. Rather than answer these questions in court, raising serious contradictions to the Israeli claim that Gaza is no longer occupied, Israel’s navy informed the lawyers that the boats would probably be returned immediately. Less than 24 hours later the boats were returned, though initial reports suggest that they had sustained serious damage and that expensive equipment has been stolen. “While the return of 1/4 of Gaza’s trawling fleet after they were stolen by the Israeli navy is a relief to Gaza’s fishermen, the fact that it only took the threat of court action in their own legal system for the boats return demonstrates how baseless Israel’s claim of not occupying Gaza is” said Fida Qishta, local human rights activist from Rafah and ISM co-ordinator in the Gaza Strip. Held in Ashdod, the fishing boats were transferred into Palestinian waters six nautical miles offshore at approximately 16:00 Gaza time and reached the port of Gaza City shortly before 18:00. There are only 12 boats of this size in the Gaza Strip, so the confiscation represented one quarter of such boats available to the Gazan population.The boats were abducted 7 1/2 miles from the port of Deir al-Balah, well within ‘Zone L’, which, under the Oslo agreement, gives them the right to be fishing within their own 20 nautical mile limit. The boats’ captains reported damage to their vessels’ – indeed one trawler had to be towed in by a second due to engine damage. Equipment such as GPS devices were also missing. The fishermens’ loss of earnings over the last ten days is still being estimated. 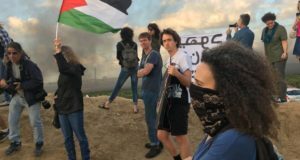 The three human rights observers from the International Solidarity Movement who were accompanying the fishermen at the time of the Israeli assault were held at Maasiyahu detention centre in Ramle, despite never being charged. All have now been illegally deported by the Israeli authorities. 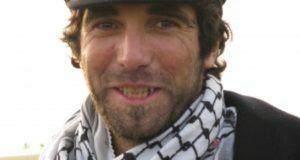 Vittorio Arrigoni was deported to Italy on Sunday 23rd November, Andrew Muncie to the UK on Tuesday 25th and Darlene Wallach to the US early on Thursday 27th November.